“‘Tis the season of myths and mellow votefulness. Boris rules a slumped blancmange Castle, close to a large river and filled with proportionally elected inhabitants, bound by the eternal rituals, quadrilles and gavottes of plotting and politics. Knowing that the unavoidable time of trial will come in the next year, Boris strikes out west to summon support. He pauses and wishes that he could seek advice from his close adviser and speechwriter, Wally Weasel, but fears that others will recognise the characteristic hard-to-pin-down style and mutter knowingly “Weasel’s words” at the back of the auditorium. Having first finished a letter to a campaign group, Boris tucks two books into his coat pocket. The first, an ancient self-help manual, now handily available as a Penguin classic, the second a lighter work of fiction, into his coat pocket. What secrets lie in the books? As gaily into Ruislip Gardens runs the red electric train, Boris wonders what evening will hold…. London Mayor Boris Johnson has blasted the Government’s High Speed Two (HS2) rail plans as ‘inadequate’ and called for the whole route through the Capital to be tunnelled. Plans for the £17billion link from Euston to Birmingham currently see the line emerging from tunnel at Old Oak Common, in East Acton, before running alongside the Central line tracks through Hanger Lane, Perivale, Greenford and Northolt. In a letter to an anti-HS2 campaigner, the mayor said he is concerned, in particular, about the environmental impact of the route through Ealing and Hillingdon. Last week, Ealing Council also spoke out against the plans on a similar basis. Bruce Heywood, close to the line in Ealing Gardens, Perivale, is pleased to see Mr Johnson and his deputy, Richard Barnes, supporting the campaigners. But Steve Pound, Ealing North MP, thinks building a tunnel beneath the borough is an infeasible option. He is now urging Ealing Council to join the alliance of councils against HS2, known as 51M – the amount it could cost each parliamentary constituency: £51million. Last week, the Gazette printed a cross-party response from the council. However, Ealing Council’s Liberal Democrat leader, councillor Gary Malcolm, refused to back it. The Gazette is happy to clarify this situation. This is one of those problems where the best answer is a logical “and” rather than an “either/or” solution. 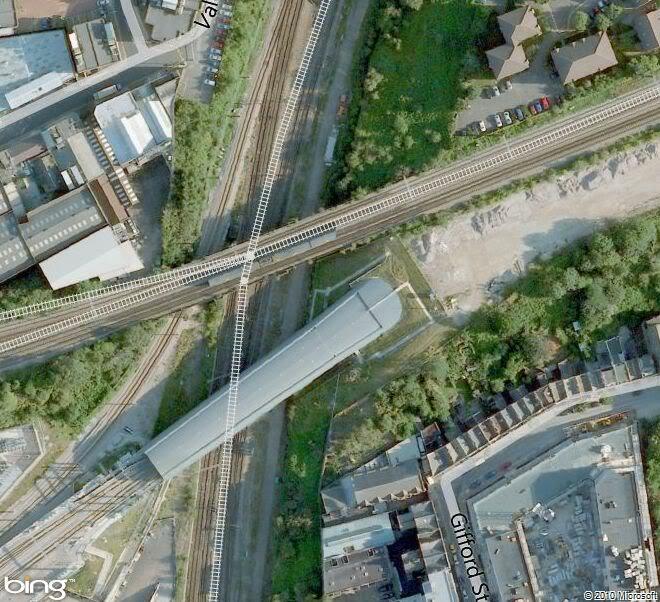 Aghast believes that the HS2 rail link should not be built (or at least not near them) whilst the scheme’s supporters see the largely vacant railway alignment that runs from Old Oak Common to West Ruislip as an ideal route for threading the new line into a heavily built up area. That line in question formed part of the Great Western Railways route from Paddington to Birkenhead and competed for traffic with the London and North Western Railways routes to Birmingham, Chester and Liverpool. Over the short journey to Birmingham and Wolverhampton the GWR offered fierce completion with, until 1962, trains taking two hours to reach Snow Hill headed, to the delight of enthusiasts, by no fewer than twenty seven of C.B.Collet’s mighty “King” class engines. Our thanks and creative commons copyright acknowledgements to Tutankhamen Sleeping for the use of this image. 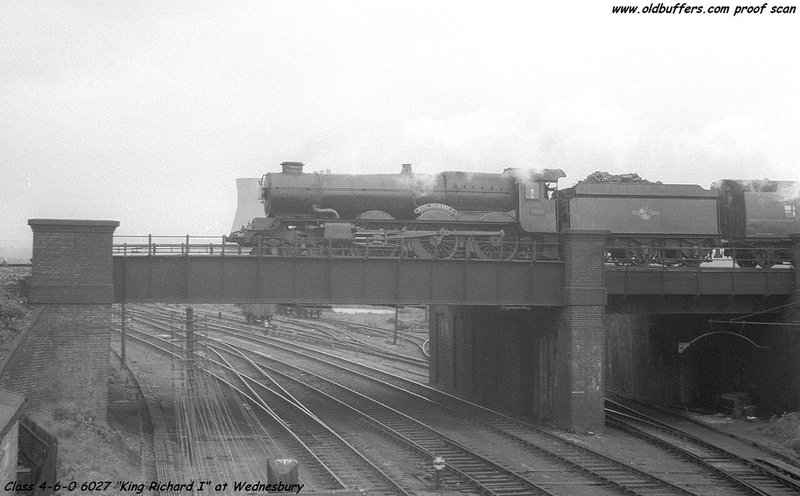 The electrification of the West Coast Main Line saw the demise of through services on the 6th March 1967. The route slipped back into decline. The last regular service was a peak hour commuter train from Banbury at 07.15 which returned from Paddington at 17.53. It was hauled, still to the delight of a later generation of enthusiasts, by English Electric Class 50 locomotives, known prosaically to spotting cognoscenti as “Hoovers”. Although the line north of South Ruislip subsequently underwent a renaissance, trains from Birmingham then ran into Marylebone. The route down to Old Oak Common, running parallel to the Central Line was used by the odd train to keep up the driver’s route knowledge of an emergency route, but most of the time it slumbered. Until, that is, the HS2 route was put out for consultation when, alarmed by the prospect of fast and noisy trains rushing through their cities and countryside, the Agahst (Action Groups against High Speed Trains) pressure group was formed. This was the group to whom the Mayor addressed his remarks. Close study of his words does, however, reveal that the Mayor as a consummate politician has built a certain amount of wiggle room into his words. He describes the route through London as “inadequate” and that his aim was to “mitigate the environmental impact”. It would not be sound politics to give too many hostages to fortune in Ealing and Hillingdon, whilst just down the road at Old Oak Common the public mood conditioned by the potential for economic regeneration is different. The mayor mentions tunnelling as a possible solution. Such a suggestion has credence because it has been done before. From Stratford to Saint Pancras the original HS1 route follows the alignment of the North London line. In June 2010 we touched upon the vagaries of tunnelling in London when considering the case of the Dalston Junction slab. Apart from some minor hiccoughs when sand lenses were struck, the tunnelled route has been an outstanding success – but this success came at a price. 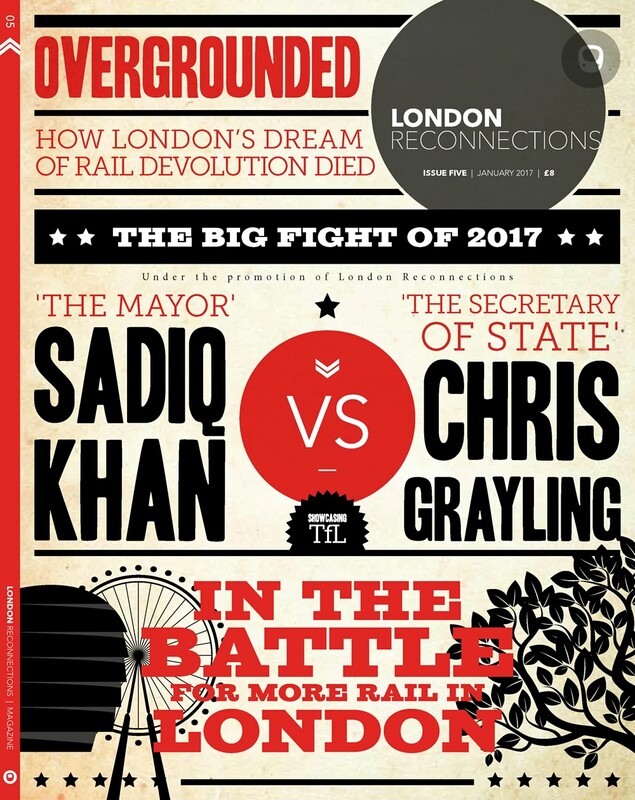 And contrary to Stephen Pound MP’s assertion, as the Mayor knows from trying to balance the books for Crossrail, tunnelling is expensive. However all is not lost, for an alternative may already exist. Originally developed as a shelter to prevent railways being carried away by rock falls or avalanches, the covered way has a long tradition in railway history. 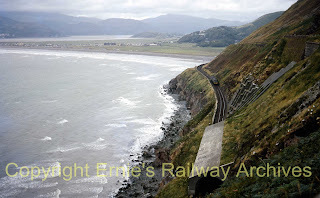 Travellers of the Cambrian route from Machynlleth to Pwllheli travel through such a tunnel at Friog, just south of Fairbourne, built after a train was swept away in 1870. 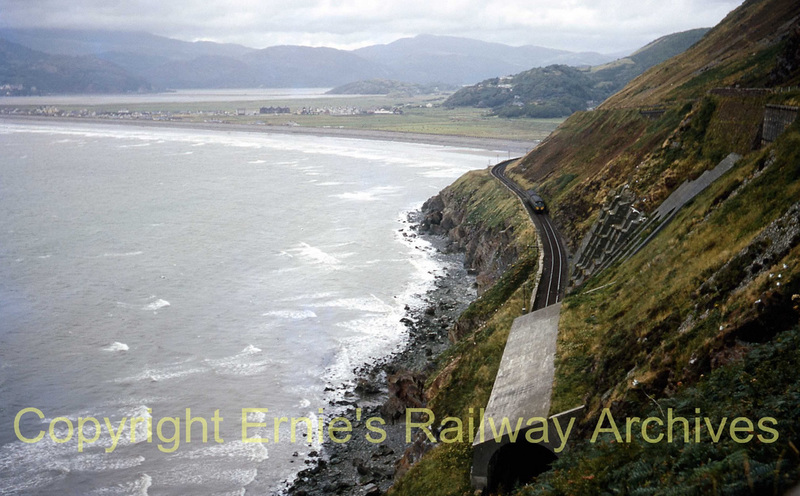 Our thanks and copyright acknowledgements to Ernie’s Railway Archive for the use of this image. The Japanese Shinkansen “Bullet Train” network was the first to face the challenge of integrating high speed trains into urban environments and responded with a range of mitigating noise pollution strategies. In Japan, Shinkansen noise is regulated at less than 70 dB in residential areas. This has been achieved by design improvements to reduce the noise footprint of the pantograph, through streamlining and other aerodynamic solutions and a kaizen “constant improvement” approach to weight saving in train carriages. At the side of the track the construction of barriers and other measures have been implemented, including covered ways. Current Japanese research is primarily aimed at reducing operational noise, particularly the boom phenomenon caused when trains exit tunnels at high speed. Following on from the Japanese example, noise mitigation has been one of the key design drivers on the European High Speed networks, including the HS1 route from the Channel Tunnel to London. An example of such noise abatement already exists in centre of London. Just north of Kings Cross, and visible from the platform ends, HS1 emerges above the East Coast Main line before turning right to run into Saint Pancras International. Emerging from the tunnel from Stratford, it runs over a bridge which features a covered way encasing the railway tracks. This can clearly be seen in the picture below. Of course one relatively small bridge might not seem enough to satisfy the residents of Ealing but in Belgium, north of Antwerp and south of the Dutch border where the High Speed Train network is being extended from Brussels to Amsterdam, a larger variant exists which not only reduces noise pollution, it also has potential emergent properties tackles atmospheric pollution. Belgian TV have helpfully produced an extended news report that shows both the inside and the outside of the covered way. The structure is two miles long with, for those of our readers who count in Routemasters, a surface area of eight football pitches. Its development is described in detail by Henry Gass writing in the Ecologist. It’s an article that perhaps does not give enough emphasis to the noise abatement potential, but his piece is none the less an encouraging read, which I am taking the liberty of quoting in full. The ‘Solar Tunnel’: a greener future for our railways? Railway infrastructure is being used to generate green energy for the first time in Europe with the inauguration of the ‘Solar Tunnel’ in Belgium. 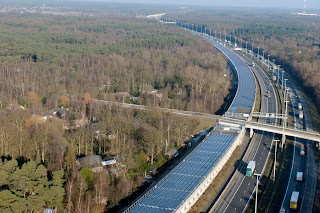 3.4 kilometres of tunnel roof near Antwerp, part of the high-speed line connecting Paris and Amsterdam, has been covered with 16,000 solar PV panels, an area of roughly 50,000m2 – equivalent to eight football pitches. The panels will generate an estimated 3.3 MWh of electricity a year, equivalent to the average annual electricity consumption of nearly 1,000 homes, and will decrease CO2 emissions by 2,400 tonnes per year. The electricity will be used to power the railway infrastructure (signalling, lighting, heating of railway stations etc.) and trains using the Belgian rail network. 4,000 trains per year – equivalent to one full day of rail traffic – will be able to run entirely on solar energy. 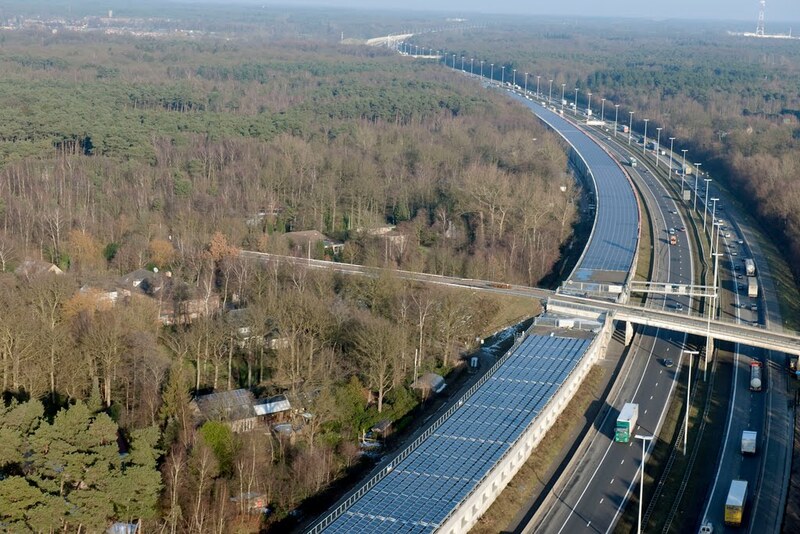 Belgium-based renewable energy company Enfinity financed, developed and built the Solar Tunnel project, at a cost, says Bart van Renterghem, head of Enfinity UK, of around £14 million. Now those of us who believe that watching Mayor Question Time is like watching “Neighbours” but with a better script, will notice that the Mayor, as well as demonstrating his tendency not to answer the question that has been put but the one to which he has a prepared answer for, is constantly accused of not doing enough in terms of transport for London and improving its air quality. Pressing the DfT for HS2 to run through a covered way in the Ealing Ruislip corridor and cutting atmospheric pollution would seem to have merits. Much has been made of the Electric City programme, although this seems to be flagging recently (a topic to which we shall return) but the emphasis has been very much on the consumption end – the charging points debate and the availability of vehicles. The use of railway covered ways as generators of power offers the chance of a more holistic assessment. Now at this stage, it is probably best to describe the Belgian tunnel as an advanced working prototype. Its ability to deliver both noise and environmental improvements needs to be monitored. But that is not to say that the design objective of the tunnel is not an excellent concept. Even if the Belgian system does not work as well as expected it will still provide a vast fund of data as to what does not work – if only we then have the talent to be able devise solutions that do work. Without apology, one of the hobby horses we saddle up on a regular basis is the need to involve the enormous talent base that exists in London’s University and College base in creating engineering solutions for London. This is an area where the Mayor should strongly and publicly enlist their support, possibly in conjunction with the Swindon based National Technology Strategy Board, for whom this is also key development area. London is already committed to a major solar installation. 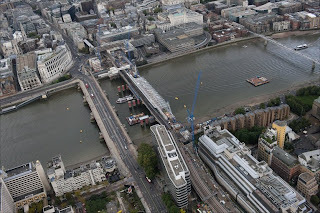 When the rebuilt Blackfriars station opens next spring 2012 spanning the River Thames, it will have the largest single collection of solar panels in the UK. The roof of the new station will have 4,400 panels and a capacity of 1MW, enough to provide 50% of the station’s electricity. As Damian Carrington, if the technology can be brought to maturity. But back to our story…. sometime later. “Those who by valorous ways become princes, like these men, acquire a principality with difficulty, but they keep it with ease. The difficulties they have in acquiring it arise in part from the new rules and methods which they are forced to introduce to establish their government and its security. And it ought to be remembered that there is nothing more difficult to take in hand, more perilous to conduct, or more uncertain in its success, than to take the lead in the introduction of a new order of things. Because the innovator has for enemies all those who have done well under the old conditions and lukewarm defenders in those who may do well under the new. This coolness arises partly from fear of the opponents, who have the laws on their side, and partly from the incredulity of men, who do not readily believe in new things until they have had a long experience of them. Thus it happens that whenever those who are hostile have the opportunity to attack, they do it like partisans, whilst the others defend lukewarmly, in such wise that the prince is endangered along with them”. “Ah so, it was ever thus”, thought Boris. Should he stand with the innovators or those against? What would Nanny do, in this situation? Why was that underlined and by whom? “Ah so it was ever thus”, she thought. Should the present or indeed any aspiring mayoral candidate wish to swipe any Belgian lollypops, Eurostar offer a regular service to Brussels from Saint Pancras. Of course BBC has a history of being Anti HS2 ! With an election in just 2 months it’s best to simply wait and see its outcome ! So “a team of engineers” is being reported  as finding a way to build an HS2 which costs nothing and does more. I’m sorely tempted to question why a broadsheet newspaper gives them the space, though it is very light on detail (seems to parallel the Midland mainline most of the way?) can anyone see any sense in the proposal? I have long been surprised that this scheme, into which a lot of thought seems to have gone, has not gained more publicity and not been scrutinised much or at all in the railway press. Alison: There is no HS2 article, and we are not asking anyone to write one, mainly because HS2 is a national scheme and London Reconnections is oriented towards London. However, articles, or discussion, about the impact of HS2 on London are welcome (hence the article you are commenting on). We are OK with the occasional passing comment about HS2, but we do not want to encourage will not allow extensive discussion of it. Of course, anyone who is interested can follow your link, or peezedtees, and inform themself. My immediate reaction, having of course been unable to resist doing so, is that their scheme is entirely uncosted. They claim it will be 25% cheaper than HS2, but I can see no significant justification for this claim. It is hardly surprising that a team of two people, even if they were working on it full time, is unlikely to have discovered something which the hundreds, possibly thousands, of people working on or scrutinising HS2, have all missed. Thanks Malcolm – that makes a lot of sense as to why I couldn’t see an ‘umbrella’ article about the value or otherwise of creating HS2. I can’t see how that would do anything for capacity on the WCML, especially the London end where capacity is most needed. The highspeeduk guy was used as an expert witness by Camden Council this week in the Select Committee to promote an alternate Euston build. He was told off by the Committee for not doing what Camden were paying him for and promoting his scheme instead (which he was given a big block of the Committee’s time last year to do just that. They weren’t convinced). One of the HSUK scheme’s most telling signs of being crayon plans is bashing through Mill Hill (and Luton) alongside the M1 to save money. When HS2 cannot use an empty track bed running mostly through light industrial areas due to impact on the urban area (and must tunnel underneath it), I would highly doubt the approval of route that would have to be cut through residential areas with demolition of properties. I pushed ‘post’ too early: The Camden Council petition to the Select Committee is going to be how the Indy ‘discovered’ the crayonista website this week. Surprisingly, given their totalitarianly anti-HS2 stance (they will, on occasion, publish an article that differs from the editorial stance on climate change and other issues where their stance is strong) they hadn’t already heard of HSUK. Hmmm, interesting website. Clearly they’ve taken some tips from the BML2 ‘how to promote your pet scheme’ manual. It even includes reopening the Woodhead line…..perhaps the north’s closest equivalent to Lewes-Uckfield? ? In a lot of ways, it reminds me of the ‘Superlink’ counter-proposal to CR1. And we all know what happened to that, don’t we? Expect HSUK to suffer a similar fate….